This creme brulee is a little out of the ordinary because rather than caramelized sugar on top, it’s caramelized marshmallow fluff. Underneath all that toasty marshmallow is crunchy graham cracker chunks. With a creamy milk chocolate custard on the bottom, how could it be bad? The brulee will begin with a custard! It’s gonna be baked, so preheat your oven to 300 degrees, and grab 4 ramekins and set them in a baking dish that will fit all four of them. Chop up the milk chocolate and set it aside. In a small saucepot, bring the cream and half and half to a boil. Reduce the heat to low and whisk in the chopped chocolate, then remove the pot from the heat. In a medium sized bowl, whisk the sugar, cocoa, egg yolks and vanilla until they’re all smooth. Gradually whisk in the hot chocolate mixture until it’s all incorporated. Divide the custard between the four ramekins, and place the pan in the center of the oven. Pour hot water into the pan surrounding the ramekins so that the water goes up the ramekins’ sides halfway. Bake the custards for about 50 minutes, until the custards are no longer jiggly when you shake them. Once the custards are fully baked, carefully take the pan out of the oven and let the custards cool slightly. When you can handle them, lift the custards from the pan of water and set them in the fridge for a minimum of four hours until they’re set and chilled. The custards can be baked and chilled up to a few days in advance of when you plan to eat them, just cover them each with plastic wrap until you need them! When you’re ready to serve them, take the custards out of the fridge and crush up your graham crackers. I had a super easy time of it by putting the crackers into a Ziploc bag and crushing them with a rolling pin. Sprinkle each custard with two tablespoons of the crushed graham crackers. Using a round tip, fill a piping bag with the Marshmallow Fluff [can I just say a little bit about how much I love real, honest to God Marshmallow Fluff? It beats the pants off of the usual marshmallow creme that you can buy. If you can find real Marshmallow Fluff, use it! 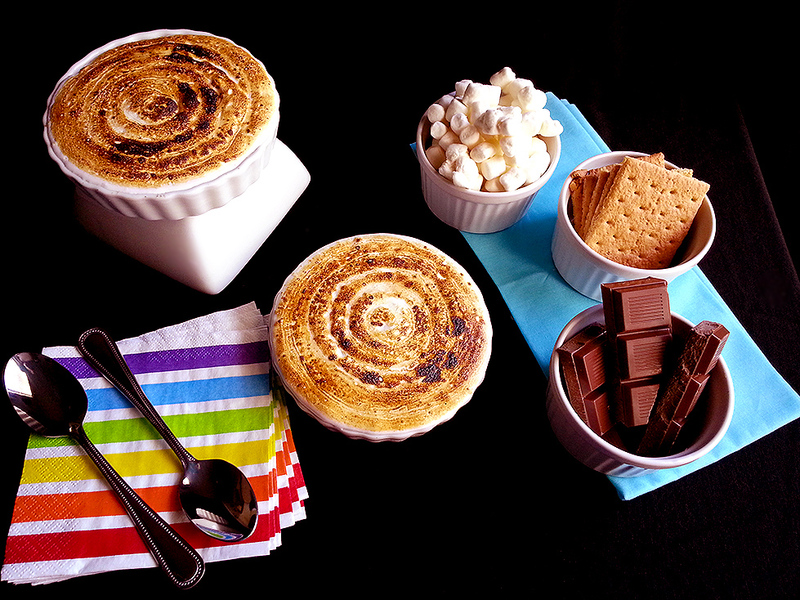 The flavor is so much better] and starting in the center of each custard, pipe the marshmallow in a spiral fashion on top of the graham cracker crumbs, going all the way to the edge of the ramekin. If you’re not using wide ramekins (I used 4 1/2 inch ones), you will not need as much fluff, so you may have extra. Make a good old fashioned peanut butter and marshmallow sandwich! Once the fluff is on top of the custards, grab a kitchen torch (or use the broiler of your oven) and get the top of the marshmallow all toasty and brown. These are best when eaten immediately, but if you have to wait a while before eating them, keep them in the fridge but don’t toast the marshmallow until right before serving. Grab a spoon! You know what to do.